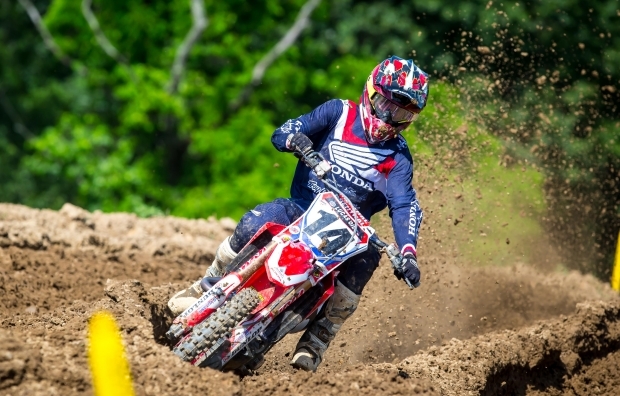 Round four of the AMA Pro Motocross series at High Point Raceway proved a challenge for Team Honda HRC, as Cole Seely struggled to secure 10th overall with 10-8 finishes, while Christian Craig was forced to withdraw early due to lack of strength in his still-healing left hand. 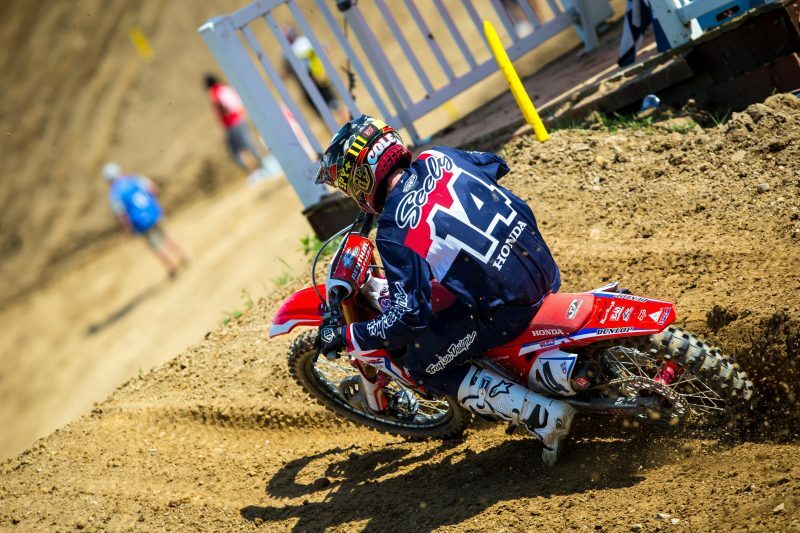 Seely got a decent jump out of the gate in moto 1 but was shuffled toward the middle of the pack around the first turn, completing lap one in 14th place. By lap nine, the California native had worked his way up to eighth. 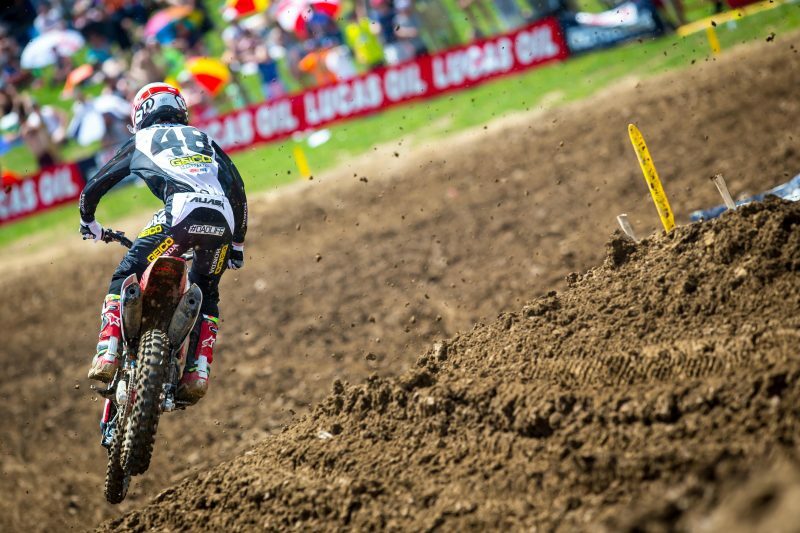 During the closing laps, Seely made a big mistake, almost sending him to the ground and causing him to back off the pace and lose multiple positions. He ultimately took the checkered flag in 10th. 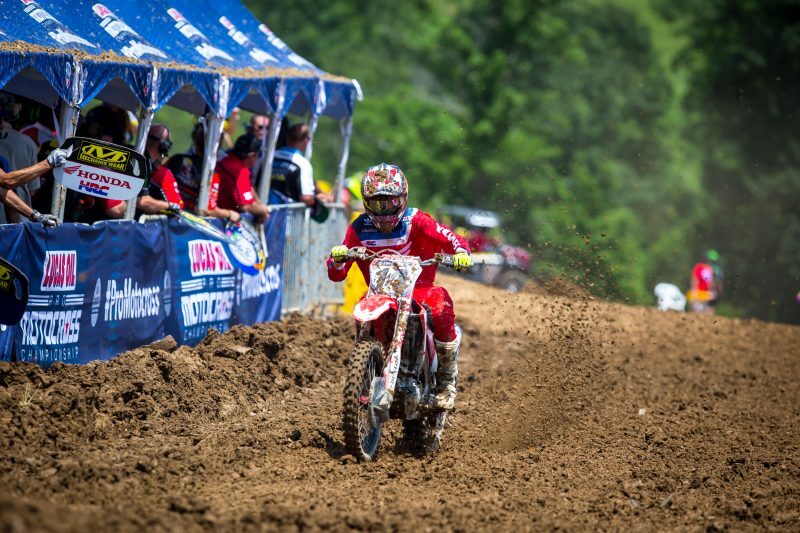 During the second race, Seely again started outside the top 10 but quickly began to charge forward. 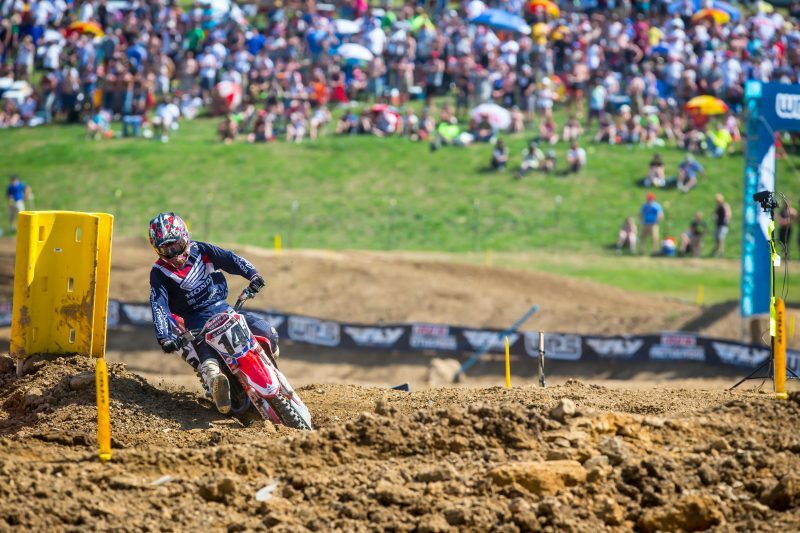 He put together an impressive run, working his way into sixth by the halfway point. 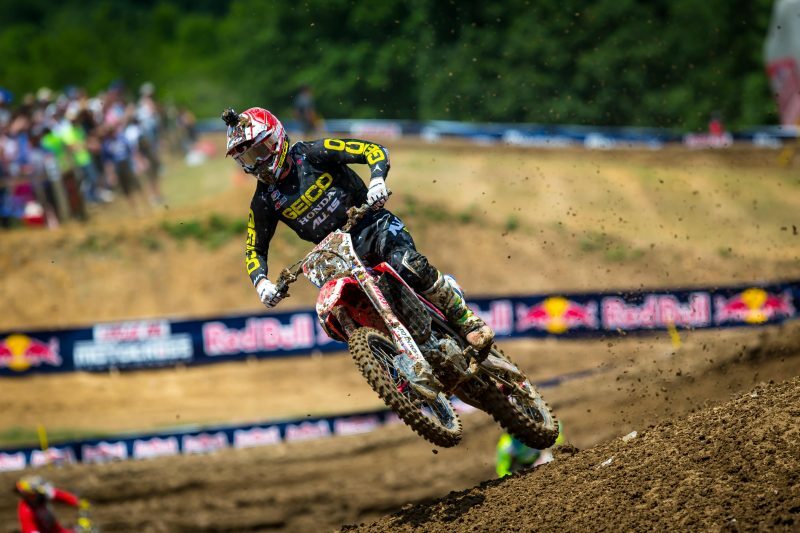 During the final three laps, another mistake caused Seely to again lose ground and finish eighth. 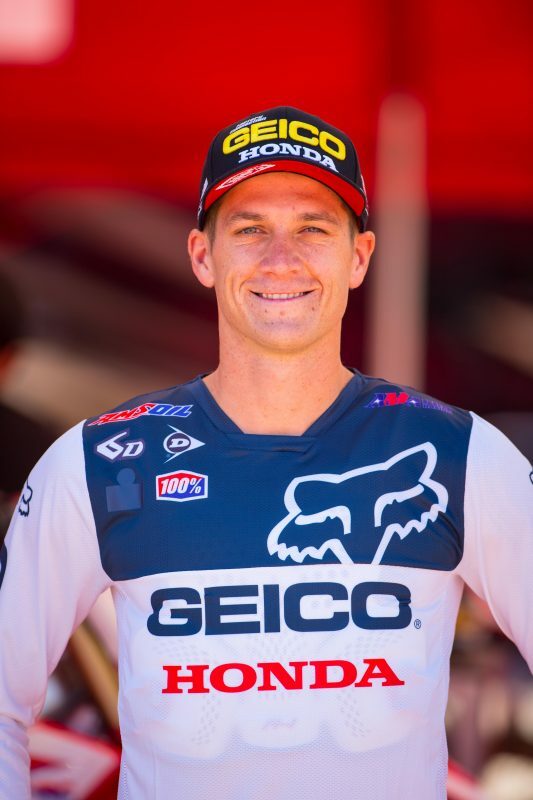 Less than three weeks after undergoing left-hand surgery to repair a “boxer break” that was sustained at Glen Helen, Craig returned to action aboard his factory-prepped CRF450R. 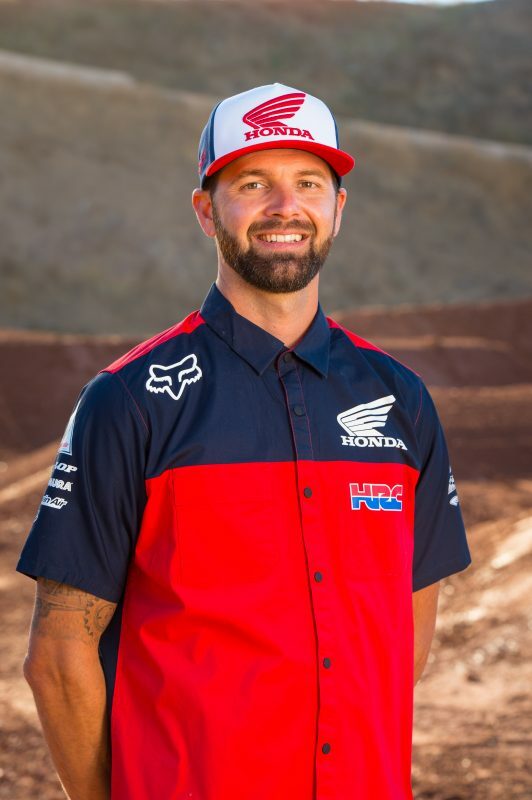 Unfortunately, the return was short-lived as Craig was sidelined once again after going down in the first moto while running sixth. On Thursday prior to the race, Team Honda HRC’s Cole Seely and Christian Craig participated in designated press day at High Point Raceway. After speaking with two local news stations, the Red Riders hit the track for a pair of 20-minute sessions, giving them the opportunity to preview the new layout. 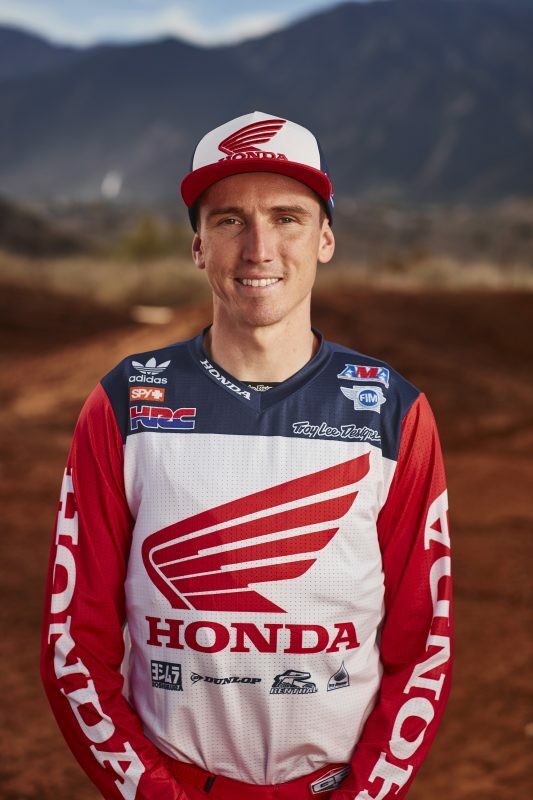 During the morning’s qualifying practice, Seely scored the seventh-quickest time with a 2:09.722 lap, while Craig landed just outside the top 10 with a 2:10.554 time. 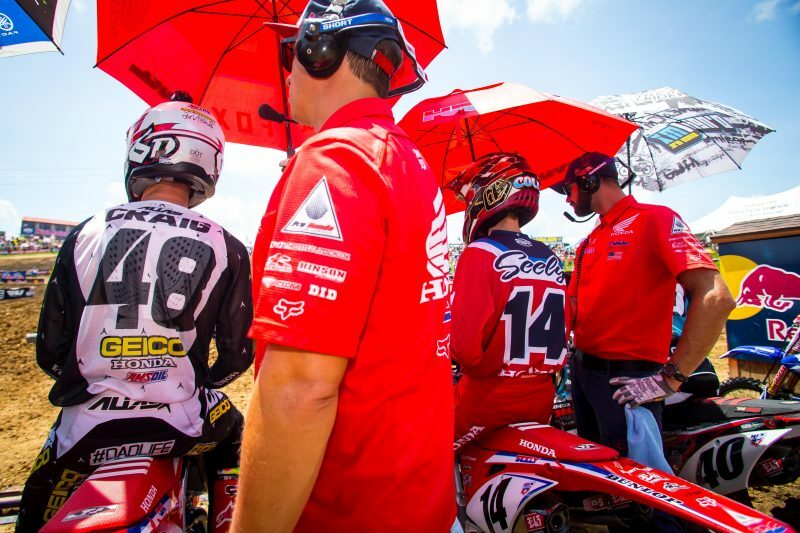 GEICO Honda’s Jeremy Martin put together two impressive rides in the 250MX class to score his first overall victory of the season with 2-1 marks aboard his CRF250R. Meanwhile, teammate RJ Hampshire, who returned to action after injury, logged two respectable rides to finish eighth overall with 9-8 scores. 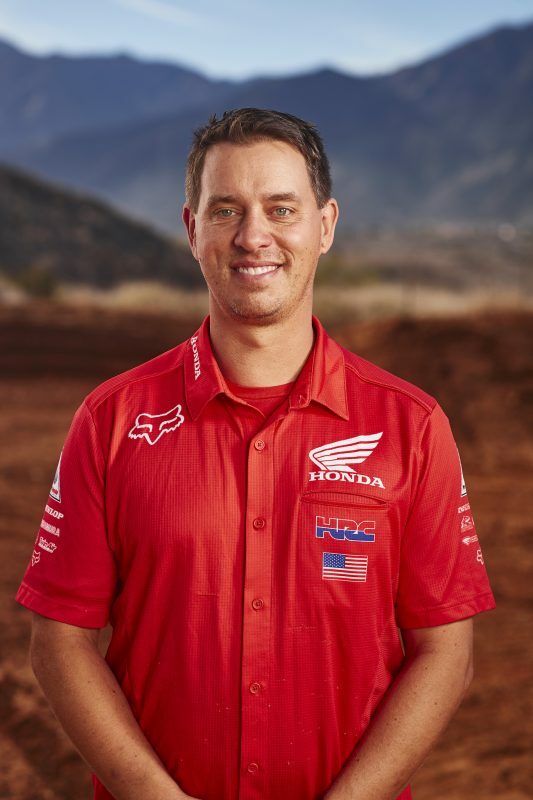 The Honda Red Riders will return to action on June 24 for round five at Muddy Creek Raceway in Blountville, Tennessee. Compared to other tracks seen thus far on the calendar, High Point Raceway is much more technical, with a European feel. 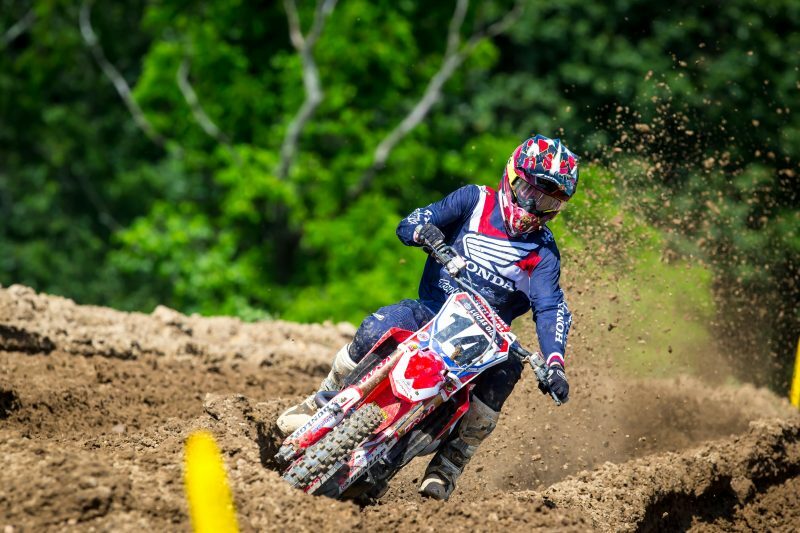 With deep ruts, constant elevation changes, many off-camber turns and an uphill start, it poses a unique challenge to riders. This year, the track showcased the same elements but in a completely new layout than previously seen. For many riders and teams, the day’s biggest challenge wasn’t the new layout but instead the overall track conditions, with a number of riders criticizing the preparation. My day went okay all in all, but I definitely didn’t get the results that I wanted. 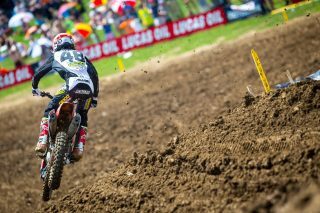 I felt like I rode pretty well in the second moto after not getting a good start. I made my way up to sixth and almost had fifth before making some pretty bad mistakes the last few laps that cost me a lot of time and positions. My results don’t show it but I’m happy with how I rode in that race. I’m taking steps in the right direction and I think my move to Florida is going to continue to help me get faster and stronger. I also need to work on improving my starts. It’s hard to fight for good positions when you’re starting outside the top 10. Today didn’t go as planned, unfortunately. I think I should’ve given myself another week to get more time on the bike and build up strength in my hand. I was able to ride two partial days leading up to the race and press day, but the intensity of the race pace and track conditions made it really hard to hold on. I think the biggest positive is that I started back up front, where I was before the injury. I got a great start in the first moto and was running a good pace before I just couldn’t hang on anymore. I went down before the mechanics’ area and decided to call it a day, to not risk something worse happening. I’ll take it day by day but will be back strong and get better results next week. Our overall result doesn’t show it, but I think Cole made improvements today, especially in the second moto. He didn’t get the best starts, which we really need to work on, but he put a good charge together. We made a change to the bike before the second moto, which was better, but I also think he rode better in general, which helped. It was a decent day but definitely not what we want, so we just need to keep moving forward. There really isn’t too much to say about today. Christian had a good start and was riding well but unfortunately just couldn’t hold on to the bike because of his hand, so he wasn’t able to finish out the day. He’s maintained his speed and fitness level throughout this injury, so I think once he gets his hand strength back we’ll see him up front more.